Congratulations to our Client LugLess for their feature in Destination Weddings and Honeymoons! 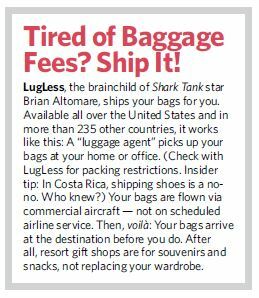 Maximize your holiday happiness by sending your luggage ahead of time with Lugless! Â A holiday travel godsend, Lugless is helping travelers enjoy a stress-free vacation by avoiding the nightmare of flying with bags to and from the airport. LugLess has been featured on ABCâ€™s hit show, Shark Tank, as well as national radio and TV news shows for its innovative service. With Lugless, you can show up to the airport bagless and breeze past the bag-check line and avoid the wait at the luggage carousel on the other side. Not to mention, you won’t have to deal with the hassle of your luggage being one of the 23 million bags lost each year, which can put a damper on any trip â€“ especially when they are filled with holiday gifts. A few days before your own departure, a LugLess representative picks up your luggage and sends it to your final destination ahead of time, making arrangements for safe handling on either end. LugLess handles all of your luggage needs from carry-ons, standard bags, over-sized bags, golf clubs, skis and snowboards, surfboards, bikes, baby seats, strollers, and much more! Once you arrive to your winter wonderland, your stuff will be at your destination waiting for you. Best of all, Lugless guarantees that your luggage will arrive on time. Check them out at LugLess.com!